Originally Published: August 14, 2018 9:51 a.m.
GRAND CANYON, Ariz. — Lightning-caused fires sparked by Arizona’s monsoon range from high-priority suppression efforts to monitored burns optimal for forest health. Easily the most visible of the several fires burning on the North Rim, the Obi Fire has consumed 9,921 acres. The fire continues to back down toward Cape Royal, and Grand Canyon National Park has implemented temporary closures for public and firefighter safety. These include the Swamp Ridge Road, the North Bass Trail, and the Powell Plateau Trail. Fire Point, the Nankoweap Trail, and the Point Imperial Trail remain closed. Grand Canyon National Park has also closed Cape Royal Road from the junction with the Point Imperial Road. Included in this closure are Cape Final Trail, Cliff Spring Trail, the northern section of the Ken Patrick Trail from Point Imperial to Cape Royal Road, and the southern section of the Ken Patrick Trail from Cape Royal Road to the old Bright Angel Trail. These temporary closures are in effect until further notice. 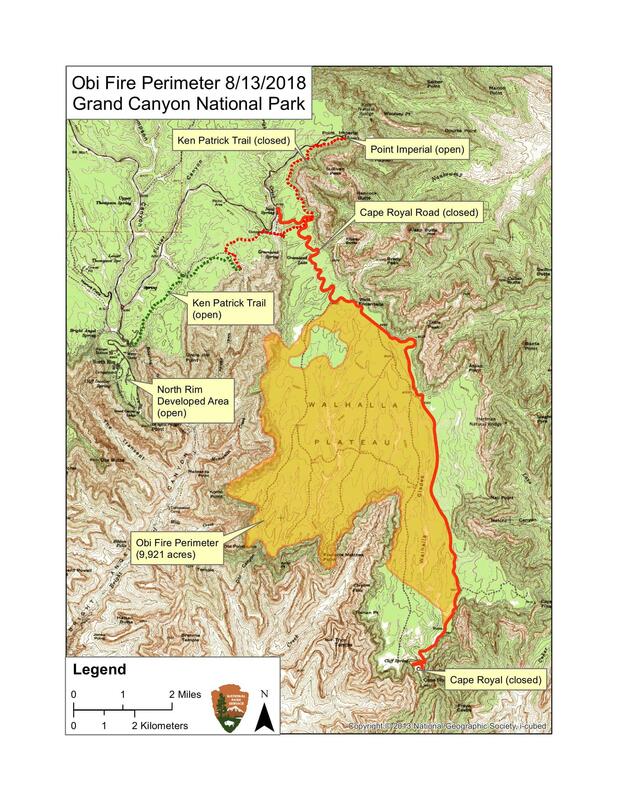 The road to Point Imperial and all other North Rim trails and facilities are open at this time. Prior to visiting these areas visitors should check-in at the Backcountry Information Center or the North Rim Visitor Center. "Due to public and firefighter safety, the Cape Royal Road still remains closed. With sudden wind shifts and smoke across the road, the Cape Royal Road is unsafe for motorists at this time," said Incident Commander Paul Lemmon. Resources assigned to the fire include a type two hand crew, three engines, one helicopter, one helitack crew and a fire ecologist. The Obi Fire has been burning since July 21. Fire managers plan to continue the strategy of confining and containing the lightning caused fire in a predetermined area while providing for point protection of identified sensitive natural and cultural resources. US Forest Service spokesman David Hercher said Aug. 13 the Stina Fire, which started July 26 and has currently burned about 1,300 acres in the Saddle Mountain Wilderness 23 miles southwest of Jacob Lake, as the agency’s highest priority for suppression. Resources assigned to the fire include two 20-person hot shot crews, one 20-person type 2 hand crew, seven engines and a dozer. Fire managers plan to conduct burnout operations as opportunities present themselves on the northeast flank of the fire. Crews will continue to strengthen preparation work on containment lines in areas where burn-out operations are not taking place. Fire managers will continue to assess strategies for suppressing the west side of the fire that is over the canyon edge. Because of the fire, closures are in effect for Forest Roads 223 (going to Fire Point), 268, 206, 271, 609, 250 road south of the 250/294 junction, a portion of the 239 and all Rainbow Rim trails and scenic viewpoints south of Locust Point. The trail between Locust Point and Parissawampitts Point will remain open for forest visitors. The closure order will stay in place until it is considered safe to enter the area. Crews are also working to fully suppress the Cat Fire, which has burned just over 2,500 acres in the Saddle Mountain Wilderness about 25 miles southeast of Jacob Lake since Aug. 6. Incident Commander Rob Williams said maintaining the integrity of cultural and natural resources within the Saddle Mountain Wilderness is a key management objective. “While we are concerned about these valuable resources, our most important resource is people,” he said. Visitors may see increased smoke or haze filling the canyon. Individuals sensitive to smoke can learn how to help protect their health by visiting the Coconino County Public Health Services District website at http://bit.ly/SmokeHealthAwareness. Fire information on the Kaibab National Forest is available at www.fs.usda.gov/kaibab or @KaibabNF on Facebook and Twitter or call (928) 635-8311 for recorded fire information. The fire incident page on the Forest Service's Inciweb is available at https://inciweb.nwcg.gov/incident/6030/.